We believe that matching the rider to the horse is as important as the training the horse receives. We want to make sure BOTH parties are well suited to one another. This philosophy means that will do not list our horses for sale but rather look to find the perfect match. If you are looking for a pony please contact us about our current stock. "Integrity in the horse business is often lacking. But that’s not the case with Corky Linfoot and his wife, Kathy. In any dealings you have with them, matching the appropriate horse to the client for the client’s resultant success is of paramount importance to their business. They work as a team to purchase and make horses that cannot only stand up to the rigors of polo, but will enable their riders to play to the best of their ability. And they study both horse and rider, as well as the rider’s goals and expectations, before making critical recommendations and completing sales. Polo has been Corky’s life work, and he is highly respected throughout the polo world, whatever his role, whether as rider and player, instructor, leader, umpire, trainer, businessman, teacher or friend. He has worked tirelessly throughout his career to raise the standards and safety of the game and those who play it. An excellent communicator, Corky will always tell you the unembellished truth and holds himself to rigors standards of excellence in all he does. I’ve knows the Linfoots since 1984 and consider them to be of the highest character, the most generous of nature, and the most reputable when it come to the work they do". Best Playing Pony for Billy Linfoot, Roy Barry & Corky Linfoot all in the same year! "In my early years of polo, I had the privilege to play the strings of Dr Billy Linfoot, Harold Barry and Tommy Wayman. When I turned 60, I decided to quit making my own horse and went to the people I knew were as talented as the aforementioned polo icons. Corky and Kathy comprise an extraordinary talent for producing top horses. It starts with their initial choice of prospects and then a maximum effort made by both to allow those prospects talents to flourish. Corky and Kathy are an outstanding team in all facets of life. Their integrity is beyond reproach and their willingness to help out is ever-present. I put my money where my mouth is and purchased 9 horses from them. I cannot say enough good things about them as horsemen, people of integrity, and what their friendship means to me." "What Corky brought me when I first started in the U.S.; He sold me a great mare, Concertina, and taught me that I was holding my reins wrong and was hurting my horses’ mouth by surprising them too much. He told me he was going to put tape on my reins and my hand shouldn’t move more than 2 inches from that mark. 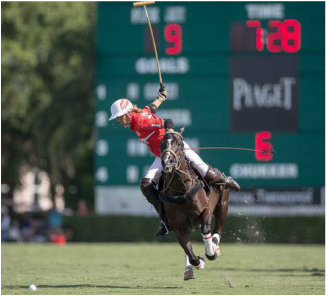 THIS changed my way of riding forever and got me better at riding, and so better at polo, too."